Total RNA was prepared using the miRNeasy kit (Qiagen) according to the manufacturer’s recommendations. In brief, 200 µl of biofluid was transferred to an Eppendorf tube and mixed thoroughly with 700µl of QIAzol reagent. Following a brief incubation at ambient temperature, 140 µl of chloroform were added and the solution was mixed vigorously. The samples were then centrifuged at 12,000 rpm for 15 min at 4°C. The upper aqueous phase was carefully transferred to a new tube and 1.5 volumes of ethanol were added. The samples were then applied directly to columns and washed according to the company’s protocol. Total RNA was eluted in 25 µl of nuclease free H2O. A fixed volume of 3 µl of RNA solution from the 25 µl eluate was used as input in each reverse transcription reaction. To isolate circulating vesicles, plasma samples from diabetic or healthy subjects were pooled together (30 samples per pool) and three pools were generated per group. Vesicles were isolated by ultracentrifugation. In brief, plasma samples were centrifuged for 10 min at 800g to remove any precipitate and the particulate fraction including apoptotic bodies was then isolated by centrifugation of the supernatant at 10,600 rpm for 20 min. The pellet was resuspended in PBS. An additional centrifugation of the supernatant at 20,500 rpm for 2h was performed to isolate microparticles. The pelleted microparticles were resuspended in PBS and the remaining supernatant was considered as microvesicle-depleted plasma. Total RNA was isolated using the miRNeasy kit as described above. To assess levels of specific miRNAs in individual biofluid samples a fixed volume of 3 µl of RNA solution from the 25 µl eluate was used as input in each reverse transcription (RT) reaction. An RT reaction and pre-amplification step were set up according to the company’s recommendations and performed as described above. RT-PCR and preamplification products were stored at -20°C. miRNAs were reverse transcribed using the Megaplex Primer Pools (Human Pools A v2.1 and B v2.0) from Applied Biosystems. Pool A enables quantitation of 377 human miRNAs while an additional 290 miRNAs were assessed using Pool B. In each array, three endogenous controls and a negative control were included for data normalization. RT reaction was performed according to the company’s recommendations (0.8 µl of Pooled Primers were combined with 0.2 µl of 100mmol/L dNTPs with dTTP, 0.8 µl of 10x Reverse-Transcription Buffer, 0.9 µl of MgCl2 (25mmol/L), 1.5 µl of Multiscribe Reverse- Transcriptase and 0.1 µl of RNAsin (20U/µl) to a final volume of 7.5 µl. The RT-PCR reaction was set as follows: 16°C for 2 min, 42°C for 1 min and 50°C for 1 sec for 40 cycles and then incubation at 85°C for 5 min using a Veriti thermocycler (Applied Biosystems). The RT reaction products were further amplified using the Megaplex PreAmp Primers (Primers A v2.1 and B v2.0). A 2.5 µl aliquot of the RT product was combined with 12.5 µl of Pre-amplification Mastermix (2x) and 2.5 µl of Megaplex PreAmp Primers (10x) to a final volume of 25 µl. The pre-amplification reaction was performed by heating the samples at 95°C for 10 min, followed by 12 cycles of 95°C for 15 sec and 60°C for 4 min. Finally, samples were heated at 95°C for 10 min to ensure enzyme inactivation. Pre-amplification reaction products were diluted to a final volume of 100 µl and stored at -20°C. The expression profile of miRNAs in biological fluids was determined using the Human Taqman miRNA Arrays A and B (Applied Biosystems). PCR reactions were performed using 450 µl of the Taqman Universal PCR Master Mix No AmpErase UNG (2x) and 9 µl of the diluted pre-amplification product to a final volume of 900 µl. 100µl of the PCR mix was dispensed to each port of the Taqman miRNA Array. The fluidic card was then centrifuged and mechanically sealed. 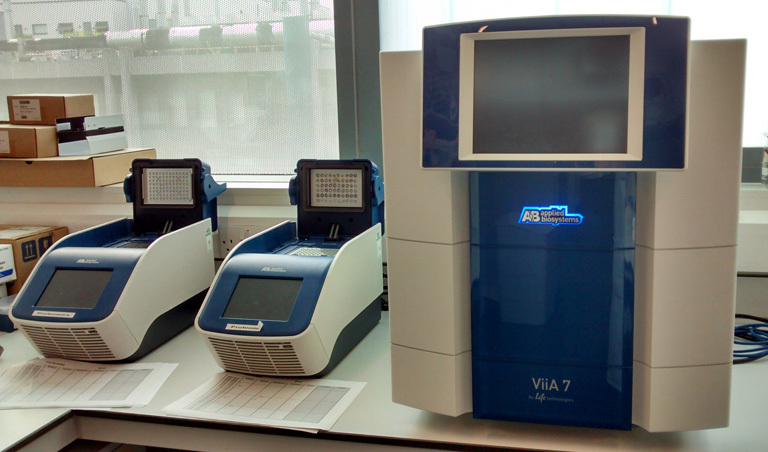 QPCR was carried out on a ViiA7 thermocycler using the manufacturer’s recommended programme. Detailed analysis of the results was performed using the Real-Time Statminer Software (Integromics). Taqman miRNA assays were used to assess the expression of individual miRNAs. 0.5µl of the diluted pre-amplification product were combined with 0.25 µl of Taqman miRNA Assay (20x) (Applied Biosystems) and 2.5 µl of the Taqman Universal PCR Master Mix No AmpErase UNG (2x) to a final volume of 5 µl. QPCR was performed on a ViiA7 thermocycler at 95°C for 10 min, followed by 40 cycles of 95°C for 15 sec and 60°C for 1 min. All samples were run in duplicates and standardized to the exogenous spike-in control cel-miR-39 or the Ct average of all endogenous miRNA measurements. For sensitivity analyses, levels of miRNAs for PCR efficacy were corrected using the LinRegPCR software.